Pretty late Victorian in style soft poly/cotton Combinations. Open crotched just the way Mistress likes them! 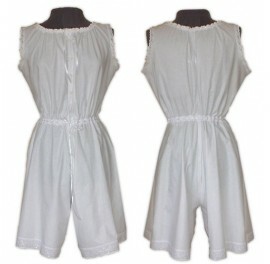 Draw-string neckline and waist for adjustable fitting Buttoned to just below the waist Open crotched from below front buttons though to back waistline Knee length wide legs Al..
An original Victorian design Combination in pretty soft poly/cotton with open crotch that buttons down the front to just above the gusset and is open all the way to the back Yoke back detail with round neckline Cap sleeves with pretty lace detail Buttons down the front to just below the wa..